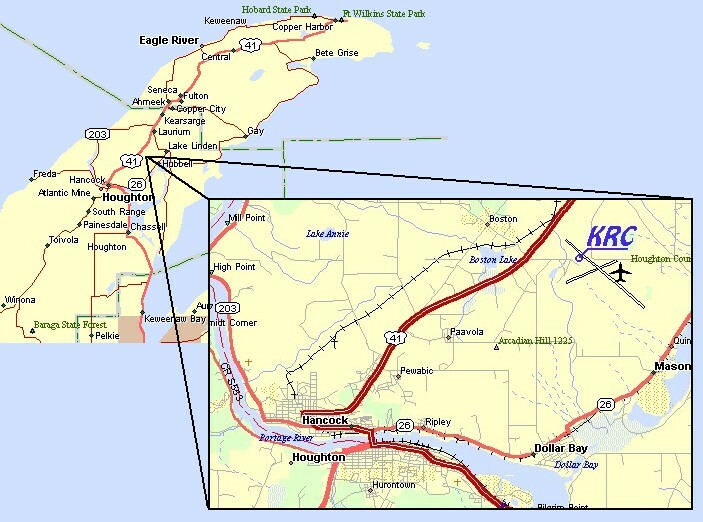 The Keweenaw Research Center is located at the Houghton County Airpark, seven miles north of the main Michigan Technological University campus on Upper Michigan's Keweenaw Peninsula. US Highway 41 runs straight through the Keweenaw Peninsula, making driving to KRC a long but very scenic trip. The area's many hotels and restaurants provide rest and entertainment. For more information on lodging and activities in the Keweenaw area, check out the Keweenaw Convention & Visitors Bureau web site or please contact us directly by filling out our feedback form, and you will be contacted immediately. United Airlines (800-864-8331) serves the Houghton County Airport (CMX) with several flights daily from Chigago's O'Hare International Airport (ORD) with connections to elsewhere. National and Avis rental cars are available locally. KRC is located very close to CMX. 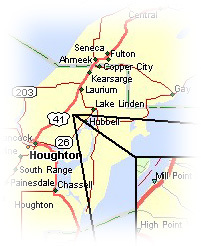 If you are flying into the Houghton County Airport, exit the airport parking area onto Airpark Boulevard. Proceed west for approximately four-tenths of a mile and turn left at the brown/grey building with the "Michigan Tech University/Keweenaw Research Center" sign into the KRC parking lot. The KRC Engineering Design Center building entrance is to your left near the sign. If you are driving from Minnesota, Wisconsin, or downstate Michigan, Michigan Tech maintains driving instructions to its campus location. To get to KRC from the vicinity of the Michigan Tech campus or the Houghton area, proceed north on US Highway 41 or State Highway M-26 until you reach the Portage Lake Lift Bridge. The bridge connects the cities of Houghton and Hancock. Once you have crossed the Lift Bridge, remain on US-41N as it curves through Hancock and climbs up Quincy Hill (there will be a large, silvery mine shaft on the right side of the road at the crest of the hill). Continue north for approximately five miles until you come to a double yellow blinker-light and a large Airport sign on the right side of the road. Turn right at the yellow blinker onto Airpark Boulevard and then proceed east for one-quarter mile until you come to a brown/grey building with the Michigan Tech University/Keweenaw Research Center sign on the right side of the road. Turn right into the KRC parking lot. The KRC Engineering Design Center building entrance will be to your left near the sign. Please sign-in with the receptionist at the front desk of the KRC Engineering Design Center building. If you would like to know the current weather conditions in the local area, please go to the KRC Weather Station & Webcam. The five-day local forecast is available from the Weather Underground. To access text files containing the past several years of archival weather data collected at KRC, go to the KRC Weather Data Archive. See the README.TXT file located there for more information on the data included and the storage format of the weather data files. Check the road conditions through the Michigan Department of Transportation.